← You can use Brands in Privately Commissioned Ketubot – but not ones in the Store! Different Jewish traditions treat Ketubot, after marriage, in different ways. Some keep it hidden in a safe. Some prominently display it in the center of the house. Some keep it in the wife’s parent’s house. My grandmother still has hers, framed, in the center of her living room; but my parents, I have no idea where theirs is. How should you decide what to do with your Ketubah? Well, one predominant factor is the culture: Sephardim, for example, tend to keep it out of sight more, while Ashkenazim tend to flaunt it more. First, how strong your connection is with the Ashkenazi or the Sephardi tradition. The more traditional Ashkenazi, the more public; the more traditional Sephardi, the more private. Secondly, how safe is your living space: if your home is secure, then it makes more sense to display it in your home. If you live in a group living situation, or there are often robberies in your area, you might want to protect it to a greater degree. Third, how artistic is your Ketubah. The more artistic it is, the more it makes sense to display it. It is, of course, part of our hiddur mitzvah tradition to make the Ketubah as beautiful as possible. 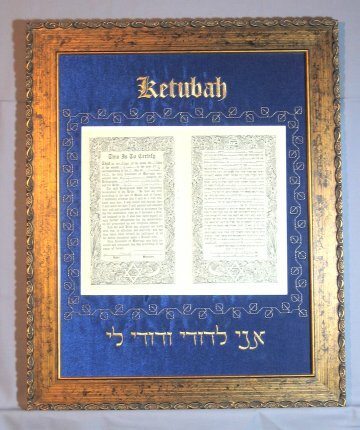 But not all Ketubot are designed beautifully–although the hiddur mitzvah tradition is not followed by Jews in various parts of Latin America, for example. Where in your home would you put your Ketubah?